Our gorgeous collection of exquisite made to measure curtains and drapes offer the most opulent and sumptuous way to dress the windows of your home. Whether your home is modern and contemporary, or a traditional masterpiece, these stunning luxury curtains will blend in beautifully and bring a real look of elegance and a true sense of drama and excitement to any room of your home. These fabulous handmade contemporary curtains are available to buy online at trade prices and come in a wide range of lavish soft fabric designs and patterns allowing you to bring luxury, colour and style to your homes décor. 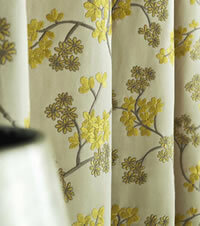 Their refined textures and lines offer a wonderfully refreshing way to bring decorative detail and design to any window. 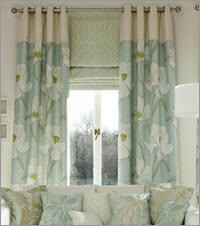 Choose from a beautiful range of headings to suit you homes interior décor. From timeless pencil pleats and tempo wave for a sophisticated streamlined look, to contemporary eyelet curtains for an altogether more flamboyant and fanciful look. 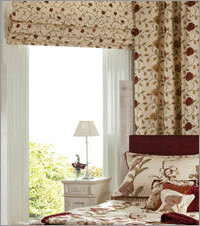 There really is a set of designer curtains to bring any window to life in the most enchanting and luxurious manor. This sophisticated and distinguished collection of patterned curtains and drapes take inspiration from haute couture tailoring and designer fabrics. Including beautifully refined floral prints, luxurious embroidered flowers and leaves as well as bold lavish geometric jacquard fabrics. These gorgeous fully lined curtains draw inspiration from ornamental details that include flamboyant Rococo scrolls, Regency stripes, pinstripes and multi stripes and the beauty of the natural world in the form of meandering foliage and large blossoming magnolias, poppies and roses. 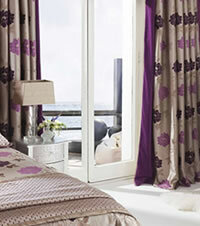 These incredibly beautiful drapes really are the epitome of luxury and style. Perhaps you are in the process of preparing the nursery for your new baby girl or boy and want some luxury kid’s curtains to provide sumptuous and peaceful surrounds for the new addition to your family. 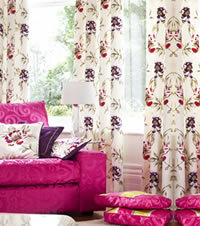 If so our inspiration collection of kid’s fabrics will allow you to do just that. 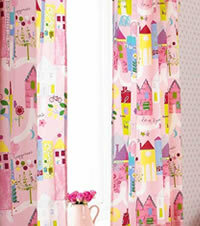 Not just for the nursery, we have a stunning collection of children’s curtains to add luxury, pretty colours and inspiring designs to and kids bedroom window and fuel the imagination of any child. From quaint traditional floral patterned bathroom or kitchen curtains to sumptuous large contemporary patterned blackout curtains for the bedroom windows, these luxury made to measure drapes are guaranteed to add an innovative and distinctly harmonious look to any room of the home. Maybe you are looking for some fabulously funky curtains, in which case we have an exuberant collection of contemporary printed designs, including quirky geometric and organic abstract designs that are stylishly adapted from original 1930s and 1950s for a truly retro look. So enjoy browsing through of fantastic collection of designer soft fabrics and order some free fabric samples to see just how wonderful they will look at the windows of your home, and rest assured that you really have found the best place to buy your luxury curtains online. 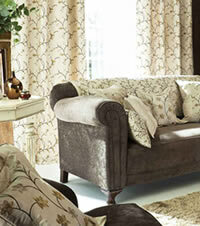 Fabric: Very luxurious fabrics from designers such as Prestigious Textiles & Romo Fabrics. 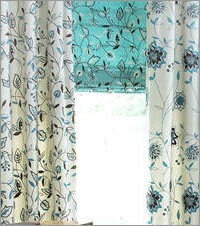 Pairs: All curtains are supplied in pairs that are fully lined, pulled to size and hooked ready to hang. Lining: Fully lined as standard with a blackout lining option. Heading: Fabulous choice of pencil pleat, tempo wave, brushed steel eyelet, brass eyelet & gun metal eyelet. Manufacture: Our gorgeous curtains & drapes are all hand made using only the finest fabrics to create the most luxurious and sumptuous window treatments. 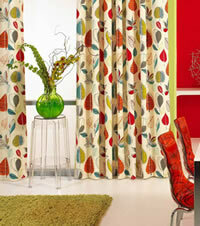 Hanging: Suitable for hanging on either a curtain pole or a curtain track. Configuration: Pair of curtains with a single pull to the right and a single pull to the left. Tie Backs: Contrasting or matching tie backs are available, please contact us with your requirements. Cushions: Contrasting or matching luxury 45cm cushions are available, please contact us with your requirements. Delivery: Approx. 2 - 3 weeks.